It doesn't take a lot of chatting before you realize that my dog is my baby. We adopted Dante from an amazing rescue when we still lived in Colorado. He was found abandoned on the side of the road with his siblings at only 2 days old in rural Oklahoma. There was no mama dog with them and the amazing rescue had to bottlefeed the puppies. At 9 weeks old, the rescue transported them to their Denver partner where we saw Mr. Dante online. We drove up to Denver that day to get him and it is the BEST decision we have ever made! Now, because he is a rescue, we're not 100% sure what kind of dog he is. However, one look at him and you know there is a LOT of border collie in him. And, if you see him in action, you see all sorts of border collie traits, including the stare. This means we have to do lots of walking, swimming in Puget Sound, and/or mind games to hopefully keep him happy! Since we are now living in Washington, the mind games are even more important as the weather is sometimes uncooperative for outdoor play. Dogs need to exercise their minds and their bodies as part of a happy, healthy lifestyle. His ears fly! So cute! Also, we have carpet in the kitchen because he slips and slides too much. One of his favorite games is his tennis ball tray puzzle. It's basically a hide and seek game for him to find special treats. No matter what kind of dog you have, a mind game is a great way to entertain them and help them with their thinking skills. A 12 cup muffin tray - You can buy one specifically for this game. Or you can do what I did and retire an old icky muffin tray to the dog game and buy yourself a nice new one! I like to bake, so I had plenty of old muffin trays that could easily be repurposed for the dog to use. Just be sure to label it as "Dog Tray"! 8-10 tennis balls - any kind, we used whatever we had in the house. A nice, tasty, good-smelling treat, like Purina Beyond White Meat Chicken Cutlets Natural Dog Snacks - You'll want something yummy for your dog, especially while they are learning how to use the game. My furry helper checking out his new treats! To set up the game, cut your treat into 12 pieces. This is why we love the Purina Beyond White Meat Chicken Cutlets Natural Dog Snacks. Besides being grain-free (no corn, wheat, or soy) and having real chicken as the top ingredient, I can cut each treat into smaller pieces so Dante gets the right serving size overall and we can still play his game. Dante doesn't care if the muffin tray is a bit beat up. Once you have your treats cut up, place one at the bottom of each muffin cup. Place the tennis balls on top of *most* of the cups. If you're teaching the game, leave at least 3-4 holding just the treats with no tennis balls. Since Dante knows how to play the game, we only leave 2 cups open. To teach the game, leave several more without tennis balls. Have your dog sit and stay, then place the tray in front of him. Let him explore! He'll probably eat the visible treats first, but the smell should draw him to the ones hiding under the tennis balls after. Watch and he'll start nudging the tennis balls with his nose or paws, or he'll lift them up with his mouth and drop them. When Dante drops the tennis balls to the floor, we remove them into our holding bag, so he doesn't continue to play with them. 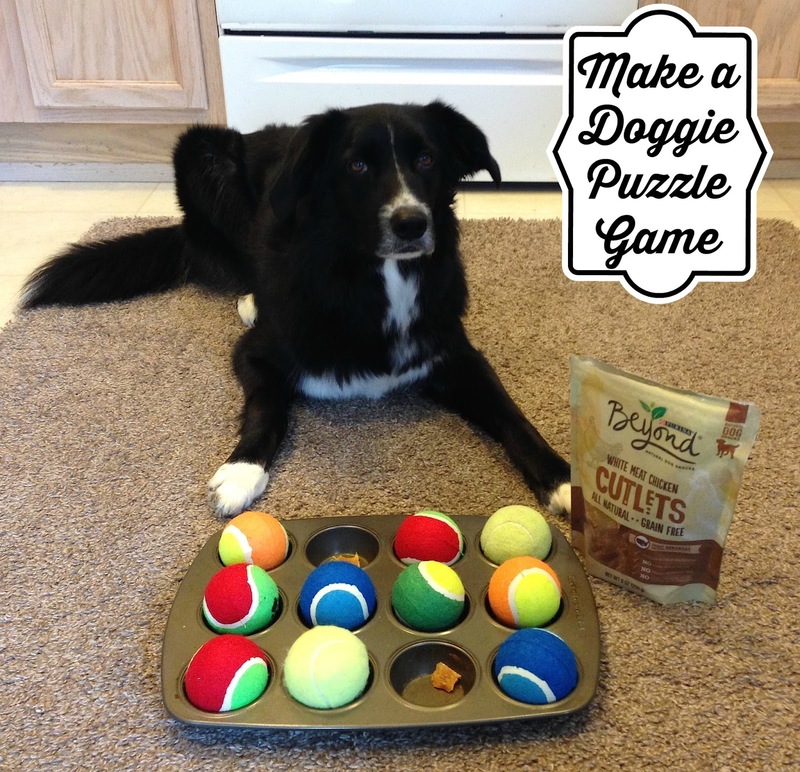 Repeat the game with any remaining treats or, as your dog learns the puzzle, mix up treats and a few pieces of his kibble in the different cups. This way his treat will last several more rounds of play. We found the Purina Beyond White Meat Chicken Cutlets Natural Dog Snacks at our local Target in the pet section. Target has the dog food in one aisle and the dog treats in the next, so make sure to look in the treat aisle for these! Dante loved them and we like giving him natural treats that are made in the USA (these are made in Arkansas). At Dante's weight, the feeding guidelines says he can have two pieces per day, so if I cut them up, we can get in a few rounds of his game! Make sure to check the bag guidelines for what your dog's size allows. 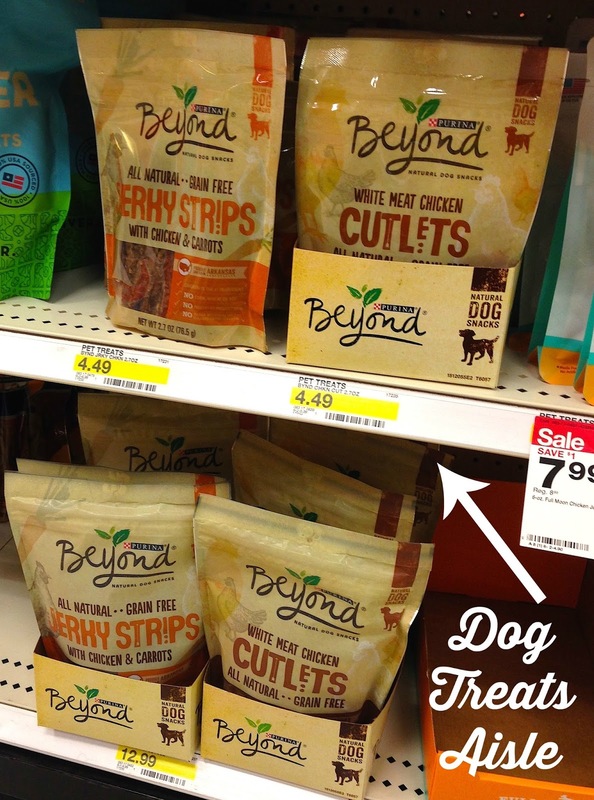 Also, from 10/4 through 10/31, you can save 10% off Purina Beyond Dog Snacks at Target with the Cartwheel app! 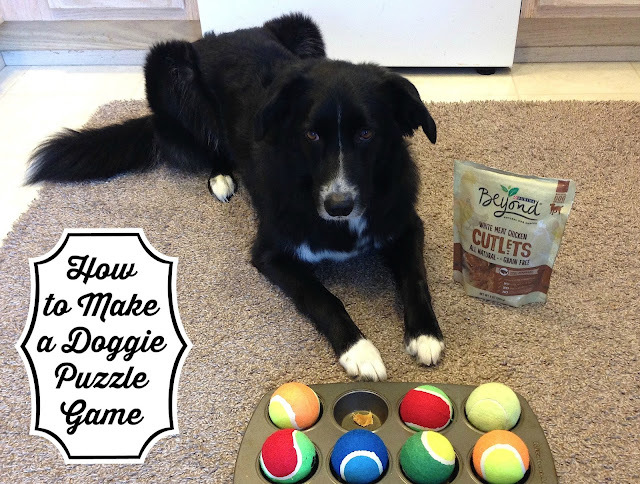 How do you use Purina Beyond Snacks from Target to treat your dog? I'd love to hear about any games you play since we always need more game ideas for Dante! Aww, what a fun game! I love your baby too, those eyes melt my heart. I wonder if Roxy would do this...uhm.